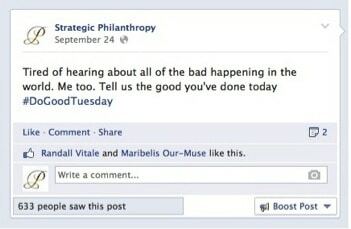 #DoGoodTuesday | Strategic Philanthropy Inc.
On September 24th, I started a social media initiative called #DoGoodTuesday. It had been an awful week. The Navy Yard shooting had happened a few days prior and the government was on the brink of a shutdown. I felt powerless and then had the thought that we, the people, can change the conversation. We actually have the power to change the entire conversation from something negative and awful, to something positive and good. 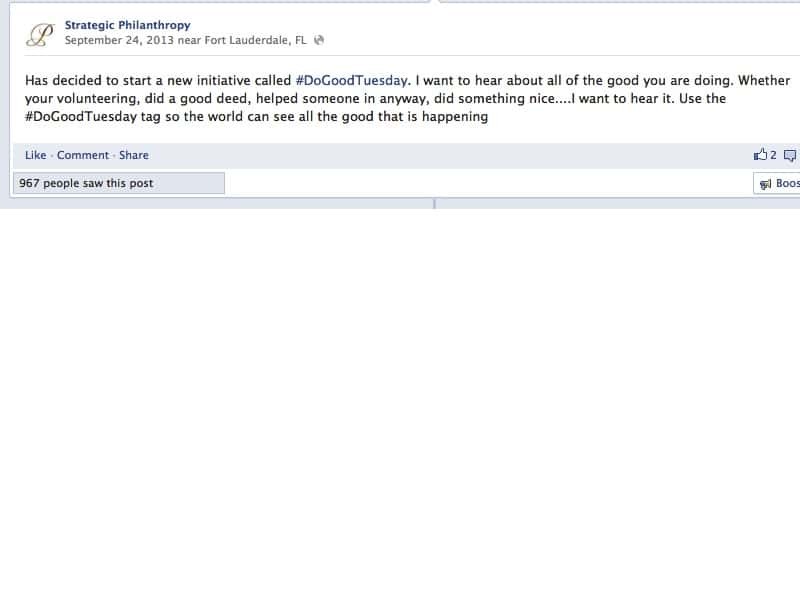 That day, I sent my first #DoGoodTuesday social media message to the world. I’m fortunate enough in my job as a community relations/corporate philanthropy consultant to see a lot of good in the world. I realized that not everyone gets to see all the good there really is in the world on a daily basis….people volunteering, people helping strangers, people doing kind things. Because of social media, certain videos have gone viral because we are getting to witness “good” in the world. And why not get to witness that every day, or in this case, once a week? Some people may say, “well, it’ll get old.” And yet my rebuttal is we watch and read the same type of depressing news every single day and accept it. So with the #DoGoodTuesday initiative, I want to hear about all of the good that people are doing in the world. You don’t have to change the world overnight, but l want people to start talking about all of the good there is in the world. Each Tuesday, I want people to share what good they’ve seen. Individuals get to decide what they want to post, but use the tag #DoGoodTuesday. I want to change the conversation and in doing so, make the world a better place.